The red panda is a beloved species across Asia. However, the mammal must coexist with a growing human population and a decreasing habitat range. Can the native people in the Eastern Himalayas learn to coexist with the red panda or will they drive it extinct? Figure 1. 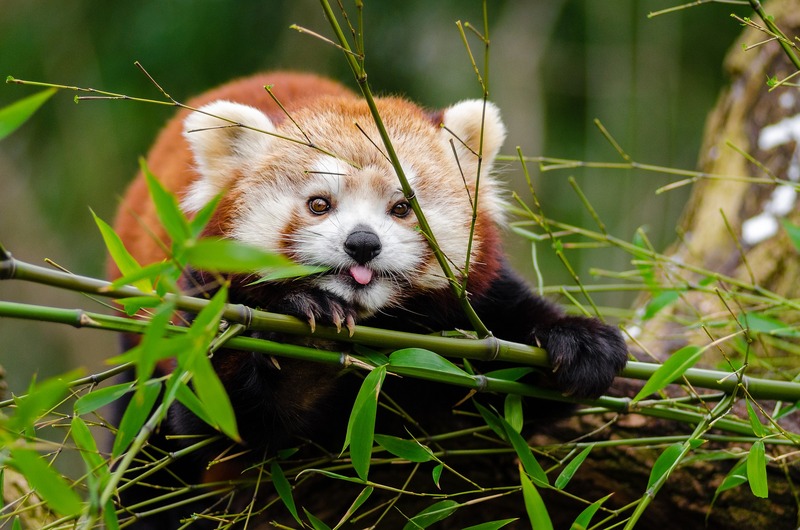 A Red Panda (Ailurus fulgens) occupying a bamboo tree, its primary food source. Photograph by Pexels, 2016, Pixabay. Public Domain. Figure 2. The red panda is native to Bhutan, China, India, Myanmar, and Nepal, however, population numbers are declining. Map courtesy of IUCN, 2012, Wikimedia Commons. CC BY-SA 3.0. There are several threats to the red panda population caused by this increase in livestock grazing. The first of which is not from the livestock themselves but rather the dogs that accompany the herds, because they attack red pandas and introduce diseases.2,11 Dogs are a necessary component of herding because they can control the large herds of livestock and protect them from wild predators.3,8 However, these dogs will also attack and kill red pandas despite the fact that red pandas only eat bamboo, insects, birds, and small mammals.3,8,11 Furthermore, herding dogs carry infectious diseases that are transferable to red pandas through contact with the dogs’ feces and urine or through a bite.3,8 One of the most fatal of these diseases is canine distemper, which is highly contagious and spread simply through contact with infected bodily fluids.3 Moreover, livestock grazing results in destruction of the natural habitat and a reduction in bamboo abundance. Livestock grazing has caused forest degradation because the environment cannot sustain the increasingly larger herd sizes.8 Red pandas and livestock do not compete for the same food, but grazing prevents bamboo from growing to the necessary height for red pandas to eat.11 Red pandas avoid eating low-growth bamboo because they are vulnerable to animals such as leopards while on the ground. The lack of forest cover that results from overgrazing also results in insufficient shelter to support red pandas.2 The species’ very specific habitat already restricts it to a rather small geographic area, so the loss of habitable land in this area is exceptionally crucial because the red panda cannot live elsewhere. Figure 3. Cow Farming in Nepal. Courtesy of Punya, 2014, Wikimedia Commons. CC BY-SA 4.0. To build a statistical model, the team first had to check for multicollinearity among the explanatory variables because for the model to have high predictive power, no two variables can be highly correlated. Since no two variables had a correlation greater than 0.7 (statistical significance is accepted when α < 0.05), statistical models developed from the data can be considered fairly accurate.8 Using various combinations of the five explanatory variables, the team created models predicting the appearance of red pandas based on the data. Models that included bamboo and elevation had the highest Akaike model weights, meaning that they best predicted the presence of red pandas in a chosen plot. Models that included livestock presence less supported the presence of red pandas in a plot.8 To test whether livestock presence was a statistically significant variable in the models, the team averaged the parameter estimates and 95% confidence intervals from the 16 models tested.8 The results indicate a 97.7% chance that the presence of livestock in a plot has a negative impact on the probability of red panda presence in an area.8 This research clearly shows that livestock grazing in an area reduces the presence of red pandas in otherwise suitable habitats that have adequate bamboo resources and are at the correct elevation. Figure 4. Rara National Park sign written in Nepali and English. Rara National Park is a protected area along the Himalayas. Established in 1976, the park is managed by the Nepalese Department of National Parks and Wildlife Conservation. Courtesy of AdwaitComred, 2014, Wikimedia Commons. CC BY-SA 3.0. The data provides evidence that the expanding livestock herd sizes in areas of the Eastern Himalayas, such as Nepal, are harming the red panda population. This issue cannot be easily fixed because the people of Nepal and other neighboring nations depend on livestock for their livelihoods. However, there is an option that could allow for the mutual co-existence of the livestock herds and red pandas. The data from Sharma, H., et al. (2014) also shows that aspect (direction of the slope of the mountain) is a statistically significant variable in the models, and that there is a much lower probability of the presence of red pandas on south-facing slopes.8 Therefore, if livestock were restricted to grazing zones that are established only on the south-facing slopes of mountains, then the livestock herds would reduce their contact with most of the red panda population.8 Furthermore, the governments in the region should disseminate pamphlets to villagers to inform them about the effect livestock grazing has on red pandas.8,10 Another team of researchers in the nation of Bhutan discovered through questionnaire surveys that a majority of villagers in the area were completely unaware that their actions were harming the red pandas.3 While the implementation of these suggestions may prevent further decline in the red panda population, implementation is unlikely in the Eastern Himalayas because it will be difficult for the governments of this region to cooperate to solve the issue. Although extinction is unlikely in the near future, the red panda will reach record low numbers and will likely be reclassified from a threatened to an endangered species. Dorji, S., et al. (2012). The Vulnerable red panda Ailurus fulgens in Bhutan: distribution, conservation status and management recommendations. Oryx, 46(4):536-543. Sasagawa, I., et al. (2003). Discovery of the extinct red panda Parailurus (Mammalia, Carnivora) in Japan. Journal of Vertebrate Paleontology, 23(4):895–900. Sharma, H., et al. (2014). Effects of livestock on occurrence of the Vulnerable red panda Ailurus fulgens in Rara National Park, Nepal. Oryx, 48(2):228-231. Wei, F., et al. (1999). Current distribution, status and conservation of wild red pandas Ailurus fulgens in China. Biological Conservation, 89(1999):285-291. Williams, B. (2006). Earth Island News: red Panda Project. Earth Island Journal, 21(3):18. Yonzon, P.B, & Hunter, M., Jr. (1991). Conservation of the red panda Ailurus fulgens. Biological Conservation, 57(1):1-11. AdwaitComred. (2014). 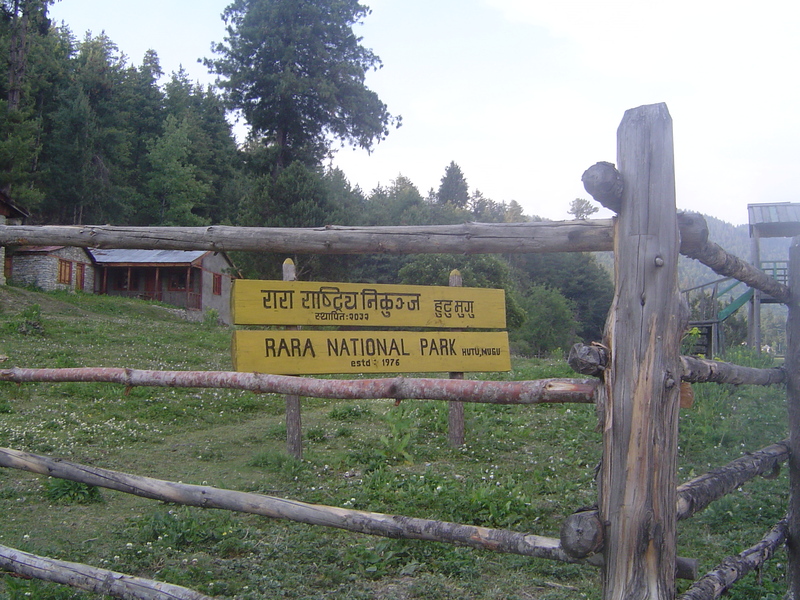 [Photograph of the Rara National Park sign]. Retrieved from Wikimedia Commons. CC BY-SA 3.0. IUCN Red List. (2012). [Map of the red panda’s habitat range]. Retrieved from Wikimedia Commons. CC BY-SA 3.0. Punya. (2014). 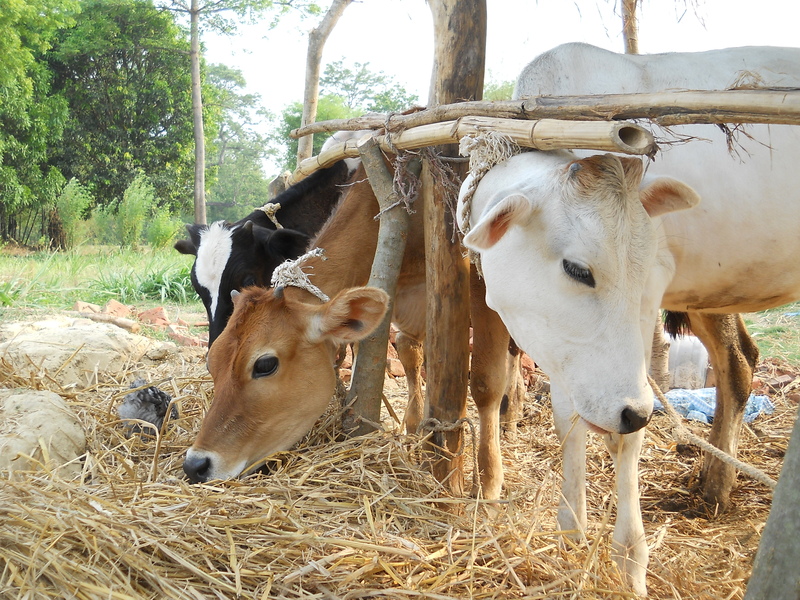 [Photograph of cow farming in Nepal]. Retrieved from Wikimedia Commons. CC BY-SA 4.0.
strichpunkt. (2017). [Photograph of a red panda in a tree]. Modified from Pixabay. Public Domain.